I volunteer on the board of my son's Parent-Teacher-Student Association board. 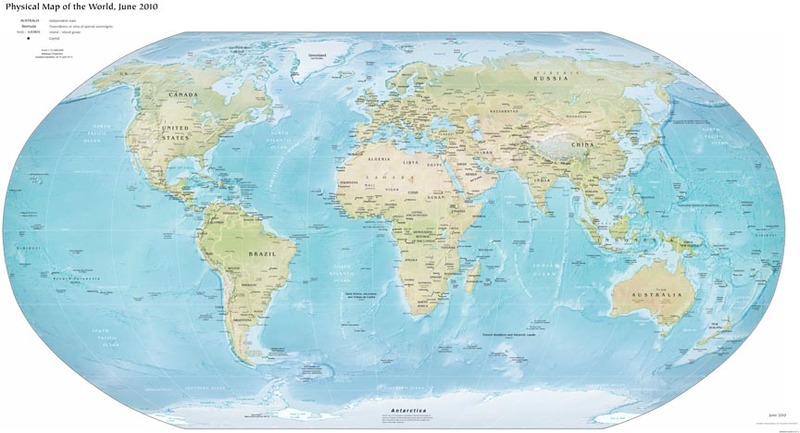 My role is to maintain and update the PTSA's website, but at a recent meeting one of the board members mentioned needing to find grant money to provide world maps to several classrooms in the school. My first thought was "How could it be possible that any classroom in any school lacks something as fundamental to a decent education as a world map?!?" My second thought was "Hey, I have a color plotter, and know a bit about maps..." and before I realized what I was saying had volunteered to provide all of the maps as a donation to the school. I love designing maps and it would have been fun to create a world map from scratch; unfortunately, I did not have time for such a monumental undertaking, so decided to search for a decent, public domain map. I found one here at the World Factbook. So far I have provided eight poster-sized versions of the map, and they seem to be a hit with the teachers and the students. 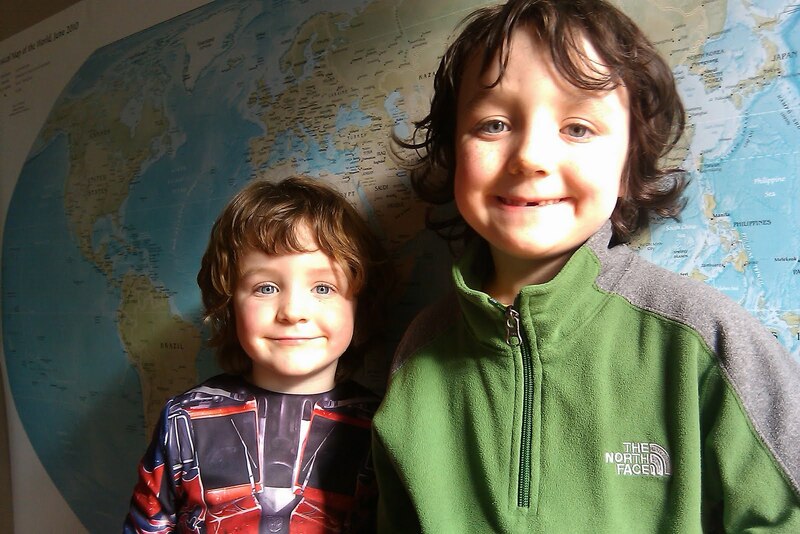 A couple of future world travelers in front of the printed map. For over a year I have been working on a series of maps featuring Mt. St. Helens (MSH) and the surrounding region for both the Sierra Club and the National Parks Conservation Association. Both groups have been advocating some major changes to the management status of the current National Volcanic Monument (NVM), and the mapping has been used to support their lobbying efforts. 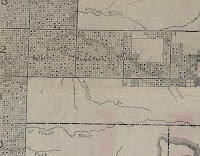 An interesting spin-off of this work is the recreation of historic land ownership patterns. In order to fully understand the current land ownership and management situation in and around MSH, it's important to have an understanding of the previous policy decisions that got us here. I have been working with Charlie Raines to develop a variety of data from historic maps (100 to 130 years before the present day) and it is really fascinating. On a personal level, it is humbling to work with these maps that were created by hand--with pen, ink and paper--before there were aerial photographs, orthophotos, satellites, even NAD 27! 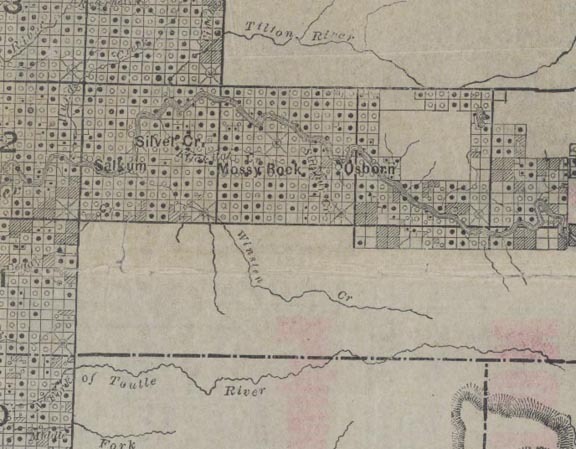 These old maps georeference remarkably well with the modern-day USPLS townships and sections. However, there have been some major changes to this landscape over the past 100 years, both natural and man-made. Mt St Helens lost over 1,300 feet of elevation as a result of the 1980 eruption, and we humans built roads, railroads, and numerous large reservoirs on the Lewis, Cowlitz, Nisqually, Bumping, and Columbia river systems. As part of the historic mapping process, I've had a lot of fun 'reversing' these changes by deleting the reservoirs, re-drawing the rivers in their original channels, and erasing highways and interstates. These maps are still a work in progress so I cannot share them just yet, but here are a couple of screen shots to give you a feel of the historic/modern juxtaposition. A "split-screen" view, showing an 1891 Northern Pacific Railroad land grant map on the left, and the modern CORE GIS map on the right. 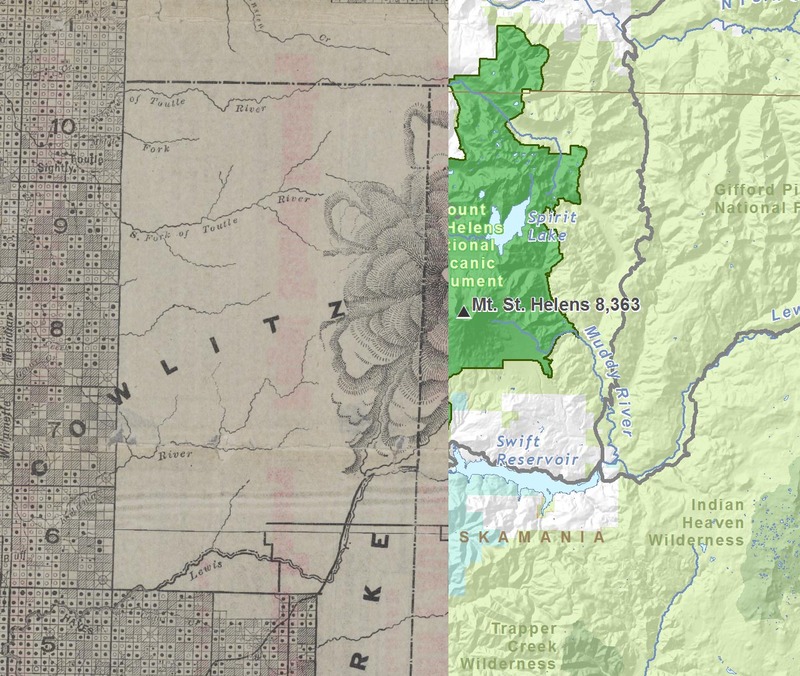 Note the fold in the historic map running right-to-left between the 'river' label on the left and Swift Reservoir on the right. Click on thumbnail to embiggen. 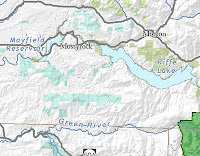 Another view of the Northern Pacific Railroad land grant map, this one focused on the region around Mossyrock. Modern-day view of the same extent.